Happy New Year! I hope everyone has had a wonderful Holiday, and that you feel ready to get back to the “real” world! I just got news that the school I have been working at the last year, wants me to stay on until summer! I still get to teach the class I´ve been working in for the last year, and I also get to teach Norwegian as a second language 5 hours a week! And I´m so excited about that! As always, a new year tends to bring out all kinds new year´s resolutions, and I have a few as well. I´m trying not to be too spesific, because then I for some weird reason tend to put off doing whatever I wanted to do, no matter how much I wanted it done in the first place… As always, most of my resolutions involves knitting or crafting one way or another. 2. Knit (Christmas) presents all through the year. Each Christmas I find myself really enjoying wrapping in those handmade things. And to ensure that I will have handmade stuff to give everyone I know, I need to knit presents all year long. 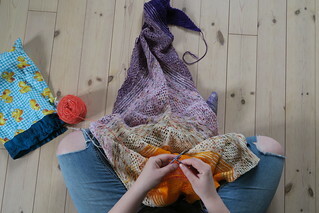 This year I have made a list over patterns I´m longing to knit. And I´ve bought 2.7kg of yarn to go with that list. (And by now you can tell that resolution number one is in trouble…) I´m planning on doing a post on my knitted gifts for everyone inspiration. But if you can´t wait, it´s all in my Ravelry queue. 3. I need to actually use my blog more actively. I´m working on some weekly/monthly topics, so that updating it might be more motivating. If anyone who reads this have any suggestions on topics, feel free to tell me! 4. Last but not least, my biggest resolution of all. After 22 years as a pescetarian, I´m going vegetarian! More spesific: Lacto-Ovo Vegetarian. I haven´t been eating much fish or seafood anyway, so I don´t think the change will be all that big. But I´m going to be strict, so from now on I need to read the food labels more closely. No more gelatin or rennet in my diet! My only “problem” will be social gatherings. My diet seems to be a hot topic when around people who does not get why I would choose not to eat meat. After 22 years of not eating meat, that topic gets kind of old… But I feel a renewed interest coming on… *sigh* Which reminds me that I´ll have to buy me some vitamin B.